Another very productive studio day starting with a massive studio clear out and rearrange to make the space more functional. 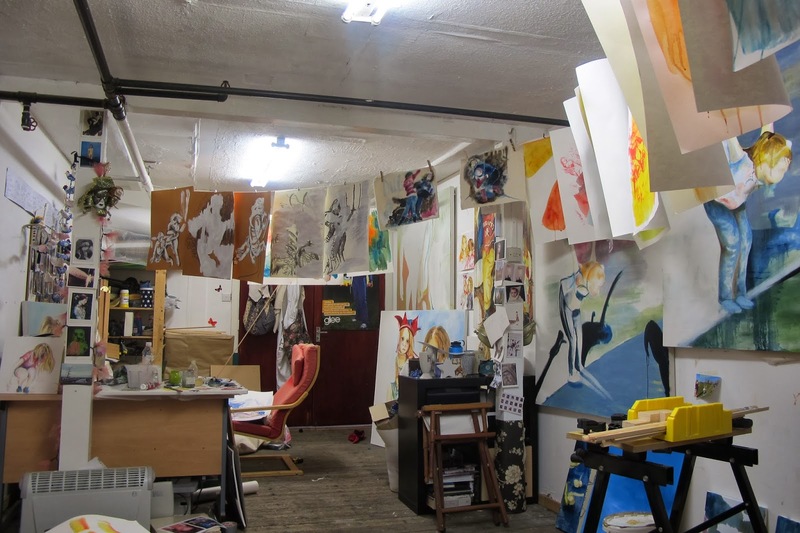 At work I am often talking about good studio practice and certainly, every so often I get to a point where I need to reassess how I am using space and what I am doing and how I can work more effectively. So I strung up a 4 sectioned washing line to I could hang work in progress to give my self more table space. 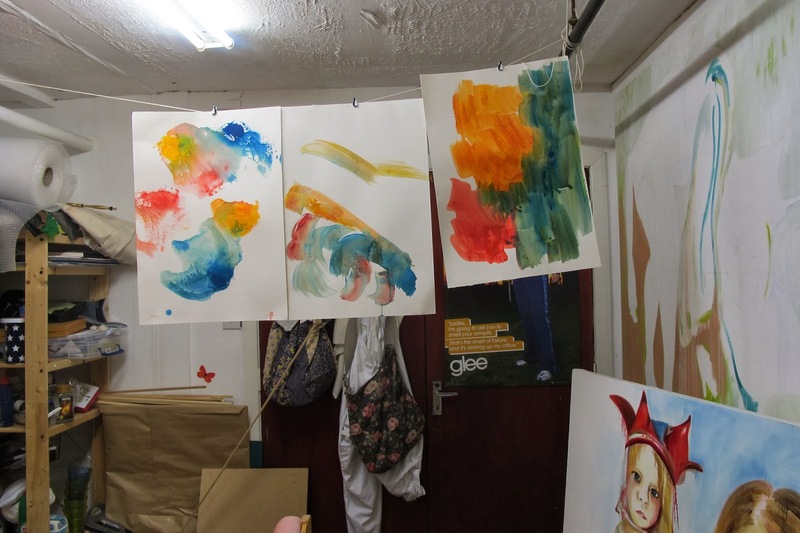 I created lots of quick backgrounds using water based block printing inks and a large brush on cartridge paper. I tried combinations of different ‘weightings’ of colour over the side and in patches to create empty areas on the page. These were inspired by some of the photos I took of the shoreline, and some from my investigation of compositional diagonals and instability. Didn’t get very far but did a couple of monoprints on the painted backgrounds. This allowed me to place the figure blindly into the space (as I was working on the back) – some parts emerge some become less visible. 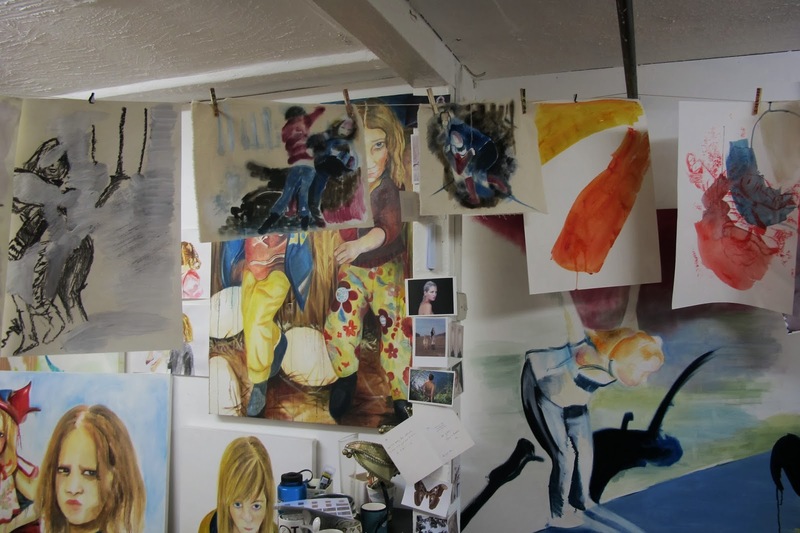 Painted backgrounds and monoprints on far left and right exploring merge/emerge. Whole studio showing work generated today! 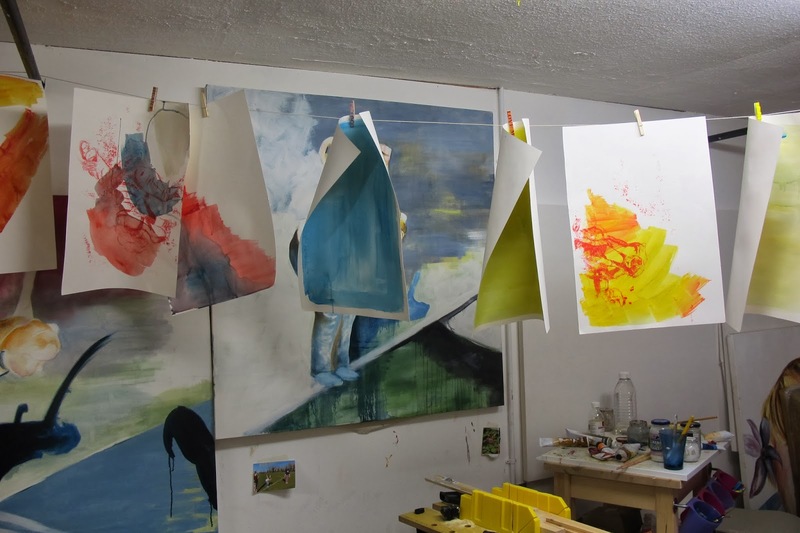 Piece on left shows first experiment with charcoal and emulsion – don’t like how the emulsion picks up and spreads the pigment. Five works on left of line show experiment with drawing and emulsion. I prefer the figures marked out in emulsion the drawn into with graphite – however, the drawing to music with obliteration has potential if I draw back in to it again. 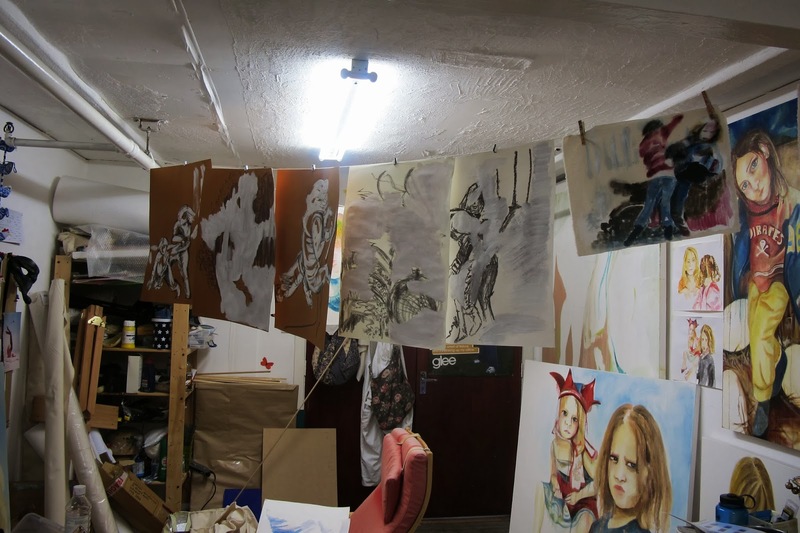 Examples of more mixed backgrounds ready for drawing or print. I made these at the end so the colours are more mixed, and the one on the left is a print straight from the table. The sense of play developed in these pieces has really underpinned the way that I have been developing subsequent works. I found it extremely difficult to be truly spontaneous with the marks but these pieces mark a departure from my more static, habitual way of making to something more authentic and involved in the process rather than the outcome. Psychologically, it was also great to earmark these works as non-show pieces; this has in fact now underpinned all of my making in the unit as I have continued to experiment throughout, never stopping and ‘finishing’ the process but instead driving the work forwards to deepen my inquiry and not pre-empt and dictate outcomes.